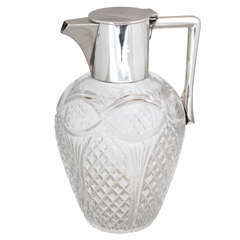 A quality late nineteenth century claret jug by Hukin and Heath. 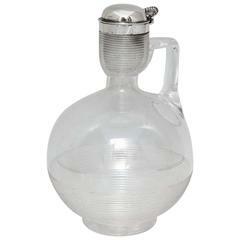 With a hand blown ovoid glass body that is more sturdy than it initially looks. The glass incorporates a dimpled design to the sides and a star cut to the base. Sterling silver handle and top hallmarked Birmingham 1890. Deceptive in that although modest looking in size, it will hold a bottle. Dimensions: 17.5 cm/6? inches (height) x 12.5 cm/5 inches (glass diameter) Bentleys are Members of LAPADA, the London and Provincial Antique Dealers Association. All prices are net of VAT for export outside the EU.